* We will never see your sensitive financial details like your credit card or bank account numbers. * Information is automatically sent with a high level of data encryption. * To help safeguard you against identity theft, every PayPal payment is followed by an email confirming your transaction. For more information on PayPal, and how the service works, please visit their websit at http://www.paypal.com. As I have been researching our church’s history, I have particularly enjoyed reading the words of our founder Thomas Walsh. In a time when Anglican churches were often renting church pews to parishioners, Walsh explained that he did not want to put a price on participation in Sunday worship. He wanted all the seats and pews in church to be free. He then quoted the words of Jesus, who said, “Freely you have received, so freely give” (Matthew 10:8). Walsh did not want parishioners giving to the church out of compulsion or guilt, but rather out of gratitude. We remind ourselves of this gratitude every Sunday when we say, “All things come of thee, O Lord. And of thine own have we given thee.” We understand that everything we have is a gift and we express our gratitude by giving a portion of our gifts back to God. We understand that stewardship is not about “guilt tripping” ourselves into pledging or tithing. Stewardship is about gratitude and moving deeper into the ever-giving flow of divine munificence by expressing that gratitude through generous giving. Ashley and I have had many important conversations about stewardship as we continue to navigate student loan debt and other significant limitations on our budget. However, we both understand the importance of gratitude and of expressing that gratitude through generous giving. And we both feel good about currently giving 9.2% of our income back to the church, with the intent to eventually start giving 10%. Thomas Walsh would also often use the Latin phrase “Deo Volente” which means “God Willing.” He understood that our plans only come to fruition when they are aligned with God’s will. The theme for this year’s stewardship campaign is “New Rector New Era.” In my research, I have learned that I am the church’s 33rd rector. However, there have only been 8 long-term rectors, who have served for more than 5 years. I want you all to know that I don’t see this job as a “stepping stone” in my career but rather as an opportunity to plant long-lasting roots that will bear rich spiritual fruits. I look forward to discovering with all of you the value of what Eugene Peterson calls a “Long Obedience in the Same Direction.” So I personally hope to be this church’s 9th long-term rector, Deo Volente! 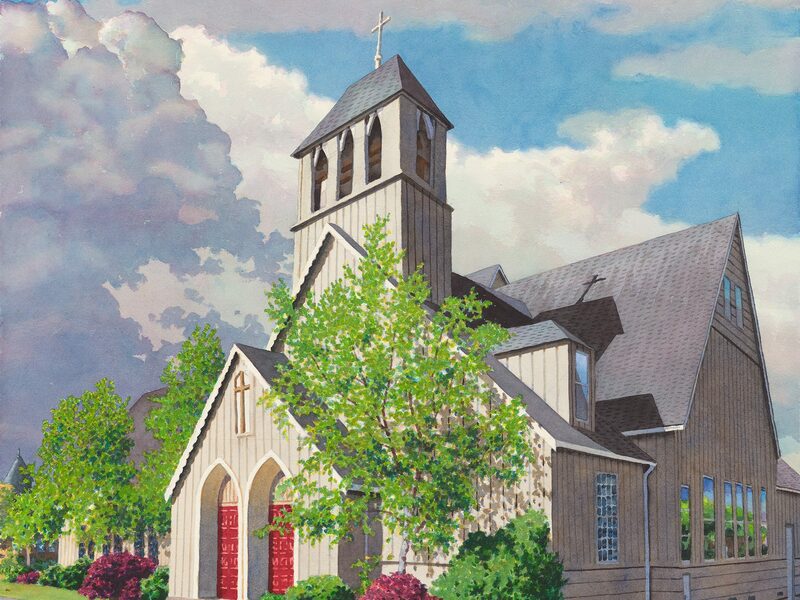 Our stewardship campaign is not just about a “new rector” but also about a “new era.” I believe God has many wonderful things in store for Christ Church Eureka in our many years together as we continue to embody the love of Christ in Humboldt county and beyond. It has been seven months since my first Sunday and I’m feeling deeply proud and thankful for all the wonderful work we have already accomplished together. It’s difficult for me to count the myriad ways that we, as a community, have continued to fulfill Thomas Walsh’s 150-year-old mission of proclaiming Christ as the evermore-welcoming and open “Door to Heaven.” In addition to the beautiful worship we offer every Sunday, we serve over 500 people a month through ministries of service, hospitality, support, and care. We also have begun a third service on Tuesday nights in which we pray the Anglican end-of-the-day prayer called Compline in our chapel; and a number of discipleship groups are meeting regularly throughout the week. All of this is just a “warm up” for our next program year and for a whole new era in the long life of Christ Church. I invite you to participate in this new era of Christ Church by expressing your gratitude through generous giving and entering more deeply into the ever-giving flow of divine munificence! Mark your calendars and make sure to join us on Sunday September 23rd for our Stewardship Kickoff, followed by our Stewardship Dinner on Saturday September 29th (please sign up for this in the Heritage Room!) and our Pledge Ingathering on Sunday October 21st.